The Rev W Awdry, the inventor of the Thomas the Tank Engine, was asked his readers where the stories took place. Well, his first books took place entirely in his imagination so he was a little stuck for an answer. Whilst on holiday on the Isle of Man, he discovered that the local bishop there had the title “Bishop of Sodor and Man”. 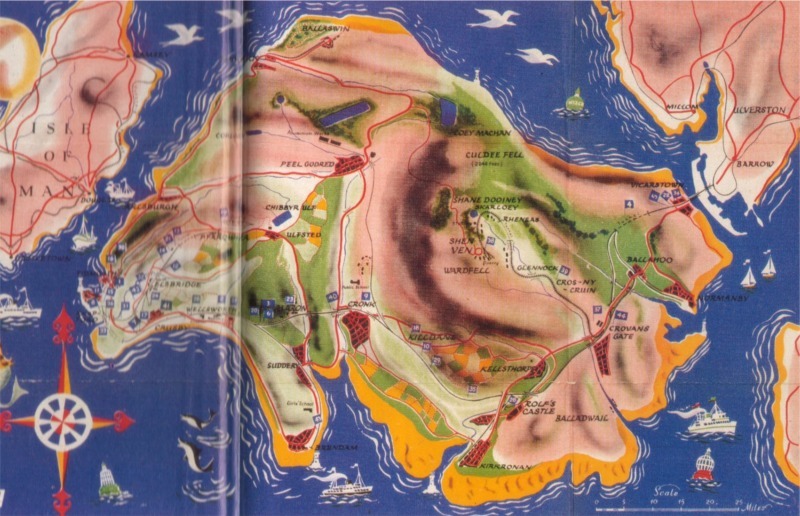 (Sodor relates to the Southern Hebrides.) Rev W Awdry liked the name and invented the fictional Isle of Sodor, located between the Isle of Man and Walney Island, just off the Furness peninsular. 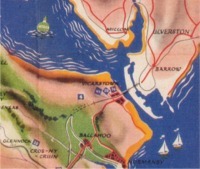 This map from 1958 shows this railway Atlantis, some five times the size of the Isle of Man, with Barrow, Ulverston and Millom all shown on the mainland. Later the Isle of Sodor was modified to incorporate Walney Island. Many stories in his books were based on real events from the South Lakes: “Gordon the Big Engine” includes a Thomas adventure called “Down the Mine” and is based on an incident when an engine fell down a deep hole at Lindal-in-Furness in 1892; Edward was probably based on the4-4-0 K2 Large Seagull class introduced on the Furness Railway in 1896; Boco was based on the BR Metropolitan Vickers diesel electric type 2 locomotive introduced in 1958, which worked mainly in the Barrow area; and several stories are also based on the nearby Ravenglass & Esdale Railway (La’al Ratty) which the Rev W Awdry visited a number of times. Thomas often visits the Lakeside & Haverthwaite Railway (about 20 minutes drive East from Sykehouse Cottage). Follow this link for more information. You can find out opening times and train fares for the La’al Ratty here. Categories: Children, Events, Local History, Things To Do | Tags: children's activities, La'al Ratty, Lakeside & Haverthwaite Railway, railway, thomas the tank engine | Permalink.